The Taoist Road to Health first provides an overview of Taoism and Do-in, placing each in historical and philosophical perspective. 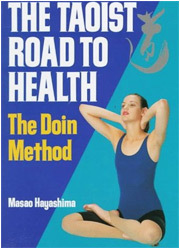 Next is the heart of the book: thirty exercises for promoting physical and mental well-being. Each exercise is fundamental in nature and easy to put into practice. They have all been carefully selected by the author as being eminently suitable for beginners. Masao Hayashima is renowned for promoting the practice of Do-in in Japan and as the founder of a 20,000-member dojo, the Nihon Dokan. This book is available in English, German and Spanish. Domestic and overseas shipment of the books shown in this website can be arranged. The price of a book is 2,625 yen. We would like to provide you with necessary information.